Creepy crawlies have a certain, well, creepiness about them that horror filmmakers like to exploit to disturb, scare, or just plain gross out the audience. This creepy-crawlie sub-genre of horror preys upon our fear of spiders, worms, and insects, many of which are made giant size in order to up the creep factor. 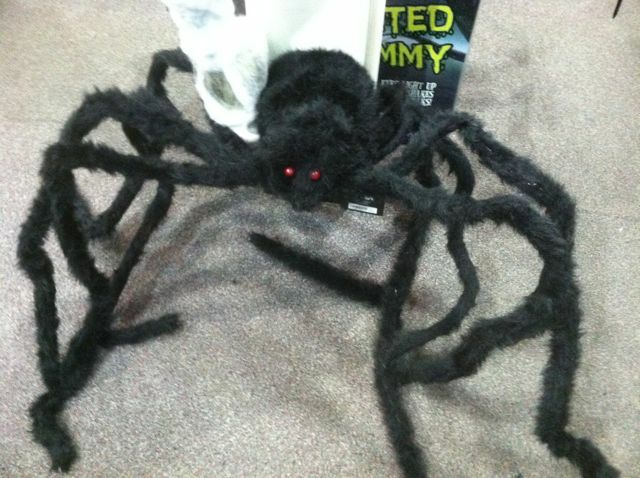 Spiders are a perennial favorite. One of the scariest spider-oriented movies that I can remember from a youth spent hanging out in front of the TV is “Kingdom of the Spiders” (1977), where a town is overrun by deadly not-giant-but-really-big web-spinning tarantulas. Never mind that tarantulas aren’t web-builders, the movie freaked this arachnophobe out. Speaking of arachnophobia (which is, if you were wondering, an unreasonable — or, I’d argue, quite reasonable — fear of spiders), there was the John-Goodman-playing-an-exterminator movie “Arachnophobia” (1990), about a small community threatened by a plague of spiders made into killers by the introduction of a violent South American species of, erm, web-spinning tarantula. If that isn’t enough to get your arachnid fix, then there’s 2002’s “Eight-Legged Freaks”: giant, jumping, spiders with very big fangs. I’m shuddering just typing such a thing. And although it isn’t spiders-threatening-civilization-as-we-know-it, “The Incredible Shrinking Man” (1957) is frightening enough, pitting the height-challenged protagonist of the title against a common house spider (I shudder at the idea that there are such things as ‘common’ house spiders) armed only with a sewing needle. This spider very likely thinks you're a fly. If you want your spiders with a bit more fun than fang, I recommend the Mystery Science Theater 3000 version of “The Giant Spider Invasion” (1997/1975) where the giant spider of the title is actually an animatronic beastie duct-taped (as far as I can tell) over a 1970s VW Bug, like the world’s ickiest parade float. And while you’re enjoying the movie-riffing of the MST3K gang, pull out “Horrors of Spider Island” (1999/1962) which, possibly playing on the mispronunciations possible with that title, puts a boatload of prostitutes (exotic dancers? hopeful starlets-to-be? baristas?) on an island with a spider-man. And not Tobey Maguire or that guy that will be playing Spider-man in the reboot of the superhero franchise, either, but an oozy, fanged, floppy-armed mutant. Separate from spiders, insects have their share of screen time, too. Again, don’t confuse insects with spiders, or spiders with insects, or any other permutation thereof. Spiders aren’t insects. Your entomological fun fact of the day: insects have six-legs, spiders get two extra, the better to hold you down when you’ve been shrunken to the size of a salt shaker by cosmic rays. Anyway, in the insects-that-want-to-kill-you-subgenre, cockroaches keep coming back even after you step on them. There’s Franz Kafka’s “Metamorphosis,” wherein a layabout kid turns into a giant cockroach overnight. Much hilarity (or depressing Kafkaesque social commentary) ensues. There’s also “Mimic,” an excellent horror movie about cockroaches that have evolved to the size of humans and can mimic the human form (if you see them in bad lighting after a few beers). Much hilarity (or cockroaches chomping on humans with virtually no social commentary) ensues. There’s also the Samuel Z. Arkoff’s (he of the cheap, late-night made-for-tv fright fest movies of the 70s) environment-gone-wrong flick, “Frogs” (1972). “Frogs,” although titled “Frogs,” doesn’t skimp on nasties, even if they don’t happen to be amphibians. There’s snakes, worms, and, if I remember right, cockroaches. Okay, maybe there’s not cockroaches, but there is hilarity (if you count the fact that it’s Sam Elliott’s first starring role) and social commentary, too, since the critters decide (perhaps by committee) to attack humans because said critters are upset about a chemical plant upstream dumping toxic waste into their river. The movie starts off with a touching-in-that-they’re-trying-to-recreate-the-emotional-impact-of-that-Native-American-chief-crying-a-single-tear-because-of-pollution-public-service-commercial-of-the-1970s scene where Sam Elliott’s character is paddling down the river in a canoe taking pictures of trash and dead fish. He’s Sam Elliott, so he doesn’t cry, but he does get angry. He also wears very tight jeans. Not to be outdone by the beasties with legs, the Squirmy-Thing Union went into collective bargaining with Hollywood to give us such stomach-clenchers as “Slugs,” (1987), “Tremors” (1990) and “Slither” (2006). Oh, and, of course, “Frogs” (still 1972). The first one, which I showed at a Halloween Party back in the 90s, was a crowd favorite. I came in from re-filling the aquarium with Bug Juice (1 liter of vodka to 1 gallon of fruit punch, no actual bugs harmed during preparation) and found two-thirds of my partygoers sprawled out on the living room floor watching this atrocious movie wherein slugs inundate a home (or possibly a whole town — I have no idea) and are menacing a family who have to take refuge on top of beds, tables, and other assorted furniture. I haven’t watched this awful-sounding piece of dreck, but, hey, can fifteen drunken people at a Halloween party be wrong? “Tremors,” although having far more humor than horror, also has just enough tension (and devoured protagonists) to make it into this list. Kevin Bacon leads (poorly) a group of small town oddballs who must try to survive in the face of an attack on their tiny community by burrowing worms of the “Dune” (1984; not a horror movie) sort — giant, vibration-seeking, and hungry. Which reminds me of another science fiction movie with a lot of horror in it: “Screamers.” “Screamers” has burrowing killbot worms that make a lot of noise right before they kill you. Meanwhile, back with the squishy critters and “Slither,” we have alien worms that infect people and make them into alien-worm-breeding hosts. It stars Nathan Fillion (of “Buffy the Vampire Slayer,” “Firefly,” and “Doctor Horrible’s Sing-along-Blog”) and is a horror parody sometimes, although at other times it takes itself too seriously. Anyway, it’s in the “Lake Placid” school of horror-humor. “Frogs”: snakes, worms, and killer tadpoles. Okay, maybe the tadpoles are just angry, but when they grow up, they’ll be angry AND human-killers. The creepy-crawly trend even spills over into supposedly non-horror fare as the reality psuedo-game show “Fear Factor” and the reality psuedo-prank show “Scare Tactics,” where contestants (or innocent passersby) are often confronted with tanks filled with squirming worms, crawling spiders, antennae-waving insects, and writhing maggots. Sometimes they’re even required to lay down among all these ickies, or even eat them. What you don’t normally see on those shows are people being creeped out by bunnies. But never fear, there are movies out there that can sate your desire for deadly furballs. We’ll take a look at those next time. Until then, keep in mind that slugs shrivel up when you pour salt on them, so keep those condiments handy; they’re not just for popcorn anymore. This entry was posted in October Horror Thread, Reviews and Rants, Themed Threads and tagged Alligator, Arachnophobia, Betty White, cockroaches, Eight Legged Freaks, environmental commentary, Frogs, Giant Spider Invasion, Halloween, horror, humor, insects, John Goodman, Kingdom of the Spiders, Lake Placid, Metamorphosis, Mimic, movies, MST3K, Mystery Science Theater 3000, Nathan Fillion, October, Primeval, reviews, Sam Elliott, Samuel Z. Arkoff, Screamers, Slither, Slugs, tarantulas, Tremors, worms. Bookmark the permalink.